No matter how unhappy you are with someone or something, violence is never the answer, people. A Walmart customer seen on video head-butting a Walmart employee during an argument, setting off an all out brawl, has been told by police not to come back to the store. 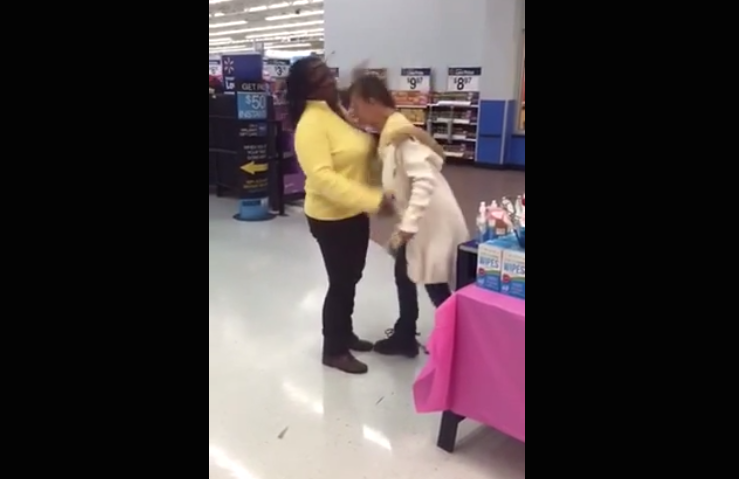 A video taken by a fellow shopper shows a tax worker and a customer arguing inside a Texas Walmart, a fight that soon turns violent after the customer head butts the other woman. According to ACB13, the employee is a Jackson Hewitt tax worker. The two allegedly got in a verbal spat the day before, when the shopper and her husband visited the Jackson Hewitt tax booth inside the Walmart to file their taxes. The woman in the video wasn’t their tax worker, but the customer says she was “very rude to us” as she was clocking in to work. The customer claims she went back to Walmart yesterday to shop, and ran into the worker, who she says uttered a profanity. After a few heated words, the customer is seen hitting the worker in the face with her head. Though the employee did not press charges, police are now investigating. They’ve issued the customer a criminal trespass notice, saying if she returns to that Walmart location she’ll be arrested, reports Click2Houston.com.